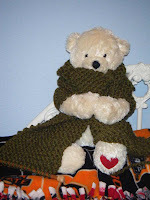 Knotty Lady: What's a bear gotta do to get a complete scarf?!?! What's a bear gotta do to get a complete scarf?!?! Many of the knitting instructions have been added on the right -- particularly so that this poor bear doesn't shank himself with a needle. Friday we'll photo the fringe section and the rest will be updated this weekend. Also on Friday, we'll preview the knitting book Naughty Needles, which has already made a few rounds amongst our delicate officemates. I'll bring the smelling salts. Bear and almost-finished scarf property of the Knotty Mama. Nice job, missy!